A one-stop-shop of key tools and research which will help your business flourish in the West of England. Do you want to scale up your business? 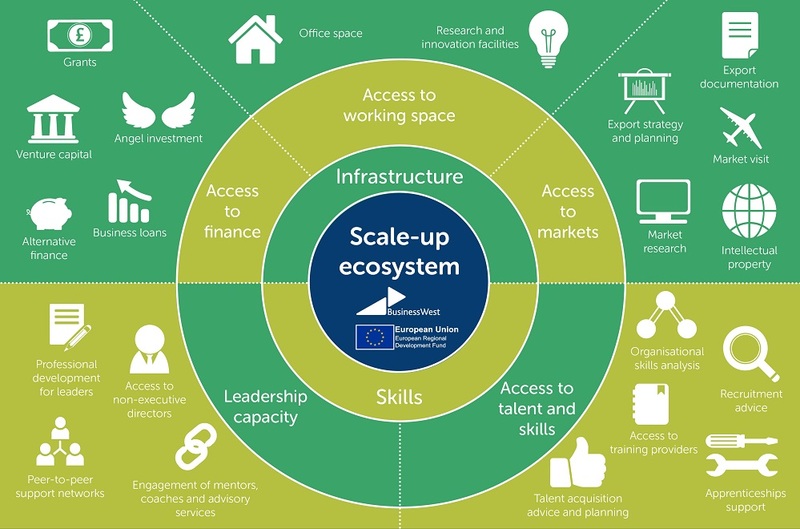 Download our Scale-up Ecosystem Infographic. The Business West Scale-up Hub has been designed to help ambitious West of England businesses get easy access to the support they need to scale. That’s because we know that talented businesses will drive forward growth in the UK. The best thing about our Scale-up Hub is that it’s been designed based on the information received by scale-ups on what they need to succeed. It’s therefore been designed by you, for you. Want to talk to someone directly? Please call us on 01275 376 233 or email us scaleup@businesswest.co.uk. We also offer a one-to-one diagnostic where we'll come and meet you to run through your needs and point you in the right direction. In the meantime, have a play around with the resources on the hub and let us know what you think! Download our Scale-up Ecosystem Infographic to see all the elements you need to scale up your business. A selection of useful business tools to provide insight into your business's performance and opportunities. Use this quickfire tool that compares the relative size and performance of your business to others in the area/ sector to determine if you’re a Scale-up. Is your business ready for rapid growth? Complete this FREE diagnostic tool to find out. Support your business growth and boost your sales & profits with a number of local finance programmes such as Funder Finder, Business Finance Finder, the South West Regional Loan Fund and Funding Circle. Together with the Engine Shed, West of England Local Enterprise Partnership and University of Bristol, Business West is proud to be involved with the Scale up Generator. Launched in the Summer of 2018, the Engine Shed's Scale up Generator provides a window into the activity, community and opportunity that exists for fast-growth, scale up companies in the West of England. Appointed as Scale up Enabler, Briony Philips, whose role was partially funded by Business West, has spent the past 12 months understanding the challenges faced by scale up companies, and encouraging the public and private sector to respond. Briony will continue her work championing and enabling scaling companies in the region with a focus on access to investment and leadership capacity, reflecting Engine Shed’s ongoing commitment to local economic growth. Visit the website to view the Scale up Yearbook, which features information about the partners the Scale up Generator has worked with, maps of scale up support, and scale up companies and insights into the challenges of scaling up in the West of England. Where are the support services and programmes in the region? The Scale-up ecosystem in Bristol + Bath is rich and vibrant. Explore the Scale up Generator map to discover support services and programmes in the West of England.